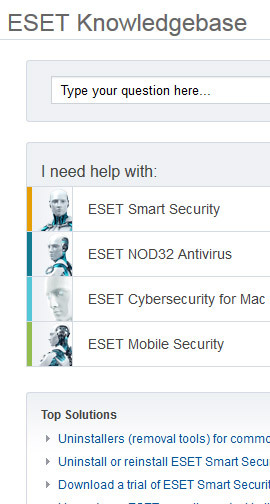 The support site for ESET.com, an antivirus software company. Customers can come to the knowledgebase to look for support articles, FAQs, advice on installation, how-to videos, support news, malware and virus information, and more. I customized the InQuira framework to allow users to identify themselves as home or business users, and then view material related to the type of user they are; created a customized search feature that allows users to scrub the search results by using drop down filters; customized articles to allow users to rate them and also to display related articles; created a Quick Help portlet on the home page displaying articles related to the most common issues that users experience; and integrated with the support case form so users see related articles to the issue they are opening a ticket for before they submit their case.